Fatty Crew – the guys who made Fatty Crab a namesake in New York City – got the original name for the restaurant from a small hole-in-the-wall spot in Malaysia, famous for its simple demeanour and mouth-watering spicy chilli crab. They took the concept to NYC and made a killing by giving urbanites new hipster digs to lounge about in. After the success of NYC’s Fatty Crab, the expats brought the restaurant to Hong Kong, finding a home in the not-so-skulky streets of food-laden Soho. Those who fell in love with the New York branch – famous for their dirt and grime – may be surprised to find a posher and sleeker version in Hong Kong. It’s all dolled up, with – not one, but two – bars and plenty of funky libations and fusion twists to get the party started. Though the decor could pass for the Bat Cave, it doesn’t mean the vibe isn’t warm. Because no reservations are accepted, we wait an hour before getting seated for dinner on a weeknight. Our servers are at least friendly and apologetic, even apologising for the torrential downpour just before our arrival. We won’t blame them for the climate but we do want them to be responsible for the food, which is said to be ‘inspired by Malaysian cuisine’. The inspiration, however, is loose as it is a fusion eatery. Mini razor clams ($50), punchy marinated shrimp ($65) and fatty sliders of spiced beef burgers, sambal aioli and pickled cucumber ($110) start us off. The seafood goes down without any fanfare and the fatty sliders arrive overcooked, with sour cucumber overpowering the mini burgers. 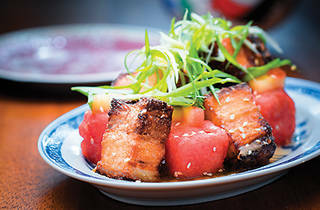 A much better effort comes in the form of the watermelon pickle and crispy pork ($130), a beautiful jumble of roasted pork belly, watermelon cubes and a salad of herbs, shallots and sesame seeds. 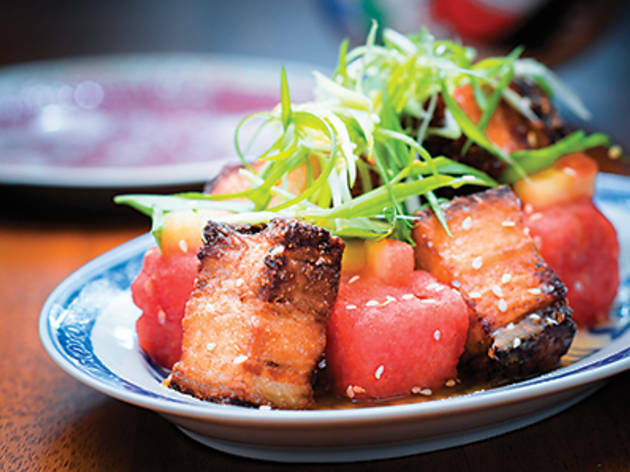 The meat is nicely roasted, breaking apart beautifully, with the warm watermelon juices compensating for any dryness the pork may have. It’s one of Fatty Crab NY’s top dishes and we can see why. Also delectable is the Fatty Duck ($110), sitting happily on a bed of fluffy rice and generously drenched in caramelised soy sauce. The dish is satiably sweet, the duck cooked to a dreamy tenderness. The much-hyped chilli crab (market price/currently $525) is supposedly the star of the menu but if you ask us whether we would prefer this unimpressive boiled crustacean, drenched in chilli paste over the duck or roasted pork, we would say no. The crab meat, while fresh, falls short of succulence and the paste has a sticky, sandy texture to it. Sadly, the nasi lemak ($130) here does not do Malaysia’s top dish justice, either. The dish is a soppy mess of curried chicken leg, pickled vegetables, fried anchovies, random strands of bean sprouts and a poached egg. It neither looks nor tastes anything like a nasi lemak – to the point of blasphemy. Lastly, both of the restaurant’s desserts on offer – the coconut egg custard covered in fried shallots ($70) and the mango-durian panna cotta ($70) – verge on the wild side. Both are a little too warm and pungent for our liking. However, a new sundae has just been introduced to the menu to appease the conventionals. Fatty Crab 11-13 Old Bailey St, Soho, 2521 2033; fattycrew.com. Tue-Sat 6pm-11.30pm.